To sweat while sleeping, is never a comfortable night’s rest for anyone. Sweat is our body’s cooling mechanism, which can be triggered when it’s hot or when there is excess movement (i.e. exercising, running, physical activities). It’s a natural process of our bodies that we all have. However, it’s safe to say that we’d rather sweat outside, than sweat while sleeping. Fortunately, there are certain bedding materials that can help with sweat which is part of our natural detoxification. When it comes to improving your sleep and decreasing the chance of sweat, your understanding of the climate of your bed and your bedding material could be the key to understand why we sweat while sleeping, and what you can do about it. To accomplish relaxing, healthy sleep; a harmonious bed climate is imperative in getting through a hot month. Bed climate can be influenced by several key elements: room temperature, humidity, breathability, and the sleeper’s own body temperature. While we are sleeping, our bodies’ demand for heat rises. Toxins are also excreted through the skin by sweat. This makes it important to sleep in a dry-warm bed climate made out of the right natural materials. A bed made out of the wrong materials can release a negative effect for sweaters. For instance, bedding made out of synthetic materials has a tendency to trap heat, resulting in an uncomfortable sleep experience. Polyester doesn’t breathe and it will hold all your sweat in rather than release it, no matter how light and airy it is. Silk is a luxurious, soft, and cool fabric that would make a bed very comfortable to sleep in. However, silk loves to cling on to moisture so once you start sweating, it won’t be a very fun night’s rest. Down fibers and feathers are also not able to wick moisture. They repel moisture from them, so sweat gets trapped between you and the duvet, bed, or mattress. The SAMINA Sleep System features bedding with open air circulation, breathable layers, and natural materials made from 100% organic cotton and filled with virgin sheep’s wool. These materials guarantee a more harmonious bed climate all year round. Handcrafted from 100% biologically active virgin sheep’s wool, it is a unique fiber that adjusts to all types of sleeping conditions. Wool bedding helps to normalize a sleepers’ temperature. It “self regulates” the temperature, making sure that each person is maintaining their own body temperature even when they’re sharing the bed with another person. Essentially when the weather is cold, the wool warms and vice versa when the weather is warm. What makes sheep’s wool an ideal bedding material for sleepers is the ability to absorb about 30% of its own weight in moisture, thus keeping you warm and dry at the same time. In order to maintain the many positive elements of the wool, it has to be carefully processed by hand. After humanely shearing from live sheep, the wool is washed and hand-processed (not chemically processed which destroys its natural properties) into fleeces and fabrics before being sewn in the toppers, duvets, and pillows at SAMINA. With SAMINA’s bedding products, natural and high quality materials are carefully crafted in order to achieve relaxing, healthy sleep. SAMINA organic cotton and wool bedding will help reduce sweat, provide harmonious climate control, and maximize comfort in sleep. Visit our Benefits page to discover more insight on the many benefits of the SAMINA sleep system. Make sure to go on our website to search for your perfect SAMINA product today. Damage to your back negatively affects your spinal health which is one of the drawbacks of the wrong mattress. A bed without proper back support is likely to cause you to develop painful problems in places where there were none before. When we stress our bodies into unnatural shapes or positions, we tend to suffer the consequences. Unlike most mattresses or beds, the SAMINA sleep system provides active support, effectively reducing or eliminating back pain associated with a lack of bed support. The body has orthopedic needs during sleep and the SAMINA system can fulfill it especially from the perspective of improving the health of the spine, the neck, and the shoulder. General and lower back pain can come from a number of sources. An irritation to the bones, ligaments, or joints will cause pain or pain that radiates to other body parts. Back problems can also inflict back muscle spasms, which can lead to severe pain and even disability. Here is how the SAMINA sleep system can help with back problems. When lying down, our system supports the spine in every position. The natural position of the spine is supposed to be a double S-shape; our system contours to maintain that all night long. The patented SAMINA slat frame gives your back a gentle stretch and this expansion of your entire spine (all 33 vertebrae!) alleviates tension and reduces painful pressure on spinal discs and nerves. The slat frames also prevent tension between your intervertebral discs and on your spinal cord where pinched nerves create pain. More people must recognize how important bed support is. Most general beds and mattresses play a passive role for the sleeper based on the material of the bed. Heavy body parts such as the shoulders and buttocks entail more pressure and the natural S-shape of the spine can be deterred through lack of pressure equalization on conventional mattresses. As a direct effect, your spine and muscles have to create the necessary balance by becoming taut. Thanks to the double-sided, freely suspended slat frame of the SAMINA sleep system, your body will realize optimal recovery of your back, both the spine and musculature. SAMINA supports and eases the strain caused by common mattresses on the body. For complete resolution of your back pain, proper neck support is completely necessary. With the right orthopedic pillow on our sleep system, your neck will receive gentle support below, opening your throat to aid in breathing and reduce snoring. We recommend the SAMINA Delta pillow, our most popular style, which correctly positions the neck and the head to benefit the cervical spine. Relief from back pain is one of many benefits people sleeping on the complete SAMINA sleep system appreciate. 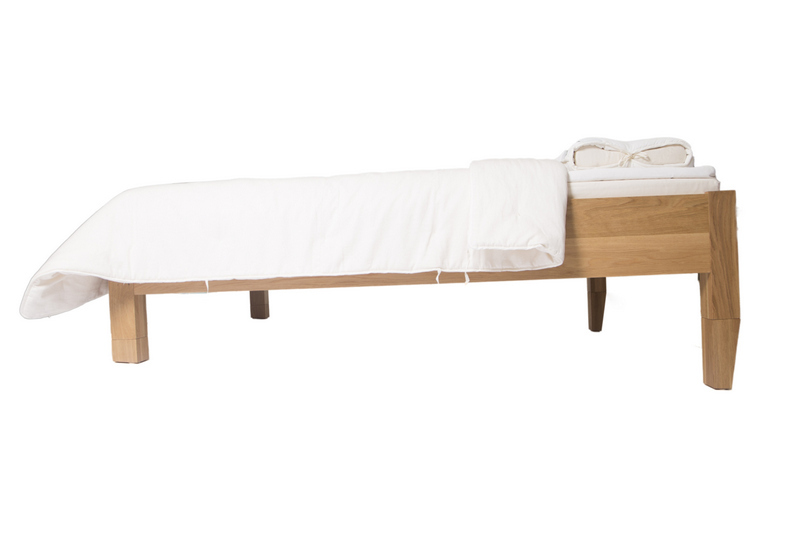 Each component is designed to meet all the important requirements needed for a bed that you would expect from one promoting good and healthy sleep. Your orthopedic problems can often be answered with just one solution. Visit our website at www.justhealthysleep.com or call us at toll-free 1-877-494-1091 to discover the benefits of the Samina sleep system on your spinal health.